One step further into the galactic plane. Message from Spirit: "Find someplace to be by 2007. Get there and be there and get your ducks in a row. 2007 is the beginning of the end of the Hopi Prophecy and the Mayan Prophesy - all of the prophesies." Initiation into the Mysteries of the Kiche Maya of Momostenango - Part Two. Crop Circles And Mayan Time What Do Crop Circles And Maya Sites Have In Common? The Maya Cosmo-Vision - Entering the Fire - An Amazing Equinox Story! 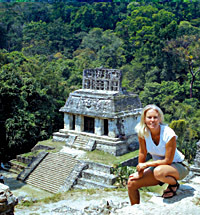 The Pleiades Aligns With Tikal and Palenque This Spring Equinox! Living on the Edge of the New World - We Are Almost Home! Entering the Mayan New Year of 8 Caban - What Will Humanity And Mother Earth Experience? The Leap Year Predicament - What to do with leap years if you are using the modern count calendar?